Immunohistochemistry (IHC): this technique allows specific staining of (mouse) tissue sections. One can, for example, compare specific markers of proliferation or cell death in healthy skin versus tumours/melanoma lesions. Quantitative reverse transcription polymerase chain reaction (qRT-PCR): this allows analysis of gene expression (specifically transcription) in tumour samples or cultured cells under different conditions. For example, I have been comparing the expression of certain transcription factors in cells that are sensitive to a melanoma drug versus cells that have acquired resistance to that drug. Cell cycle analysis by fluorescence-activated cell sorting (FACS): lastly, this method is used to quantify the proportion of cells within a population that are actively dividing, non-dividing or dead. To do this, the amount of DNA in each cell is stained using a dye such as propidium iodide, or newly synthesised DNA can be labelled using bromodeoxyuridine. 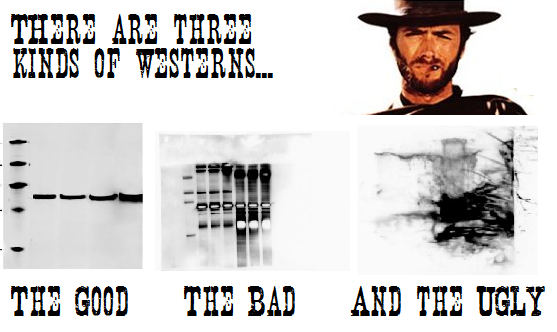 This entry was posted in Research Project and tagged biochemistry, biology, Cancer, FACS, IHC, master's project, melanoma, PCR, Science, Western blot by Victoria Wang. Bookmark the permalink. Clint would be very pleased with your analogy, no doubt…..